Earlier this morning, Microsoft held a Surface event, of course referring to Microsoft’s series of tablets. Surface was the first major initiative by Microsoft to integrate its Windows operating system with its own hardware, and is made special just for Windows 8, Microsoft’s controversial hybrid OS designed for both touch and traditional desktop computing. Microsoft's Surface division also invited journalists to a, "small gathering" in New York City. The speculation was that the event would launch a new Surface Mini tablet, a possible 7 or 8-inch tablet that will run on Windows RT. Today’s announcement, however, was for the Surface Pro 3. In an interview with CNBC, Microsoft vice president, Yusuf Mehdi, talked about how the new device sports a 12-inch display. During the event, it was mentioned that Microsoft is not trying to compete with OEMs to create new hardware. The way that Mehdi described it was that Surface answers the question, “laptop or tablet?” with the answer being both. This, in turn, creates a new category that will allow multiple OEMs to come in and create new devices. 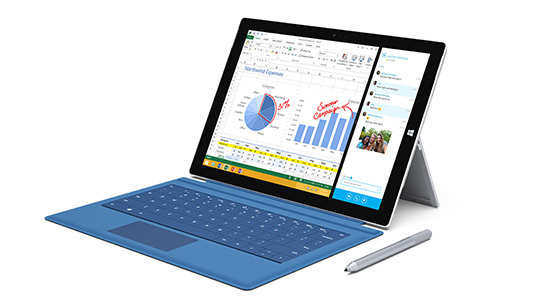 The Surface Pro 3 is 1/3-inch thick and weighs about 800 grams, or about 1.76 pounds. This makes it thinner and lighter than a MacBook 13. The device is also not lacking in power. It has an Intel i5 processor and has been designed to combine the power of Microsoft software, cloud and Surface together to provide a full feature laptop/tablet. It is really competing with Apple in the size and weight department without losing any functionality. Using the stylus pen that comes with it, you can quickly jot down notes that can be instantly sent to the cloud by a simple click of the pen. Once it is sent to the cloud, it can then be accessible from any device that has access to the account. The pen has been designed so that the tip is right where the ink is. That gives the pen more accuracy and allows you to use it to edit a script or create a work of art. It was mentioned during the event that 96 percent of everyone that owns an iPad also carries a laptop. This is because a tablet was designed to sit back and watch movies and browse the Internet, while a laptop is designed to get things done; to accomplish work. The real conflict is that you want to buy a tablet, but you really need a laptop, which direction should you take? I guess that basically was the point that today’s Microsoft Surface event was trying to make - that this type of conflict exists from the moment you walk into any store. You have tables with laptops on the right and tables with tablets on the left - and you buy one. Later, you go back to the store and purchase the other one -so you seem to always end up with both anyways since they each serve a different function. The dilemma is creating a lightweight device that still packs all of the power of a laptop, yet also has the long battery life of a tablet. Something that will allow you to use the device all day long and actually accomplish all the work that you need to. That is where the Surface Pro 3 is introduced as the answer to the predicament. While this does fall under the category of a tablet, the cost is that of a laptop. The starting price is $799. Of course, that is just the starting price. If you add the attachable keypad cover you start to look at a price of over $900. A lot of improvements have been made to the keypad, the track pad has been greatly updated and it has been designed to be more stable. To make this device even more productive, there is also a docking station that allows you to connect to a full keyboard and the ability to connect to a 4K monitor. Three versions -- a Core i3, Core i5 and Core i7, each ranging higher in price -- are availiable. The Surface Pro 3 features a large 2160x1440 2K color calibrated screen and 3:2 aspect ratio with multitouch input. That means that you can swipe, pinch and drag whenever you need. The device also includes a full-size USB 3.0 port, microSD card reader and Mini DisplayPort.